Obertauern promises the most reliable snow anywhere in the Alps, says Kika Sroker-Miller. Famous for its starring role in the Beatles film Help and acknowledged as one of Austria’s finest ski resorts for beginners and intermediates, Obertauern is the highest ski resort in the SalzburgerLand region of Austria, its elevation and topography making it snow-secure all year round. Locally known as ‘the snow bowl’, Obertauern is surrounded by awe-inspiring alpine scenery, with record-breaking snow and over 100km of pistes; a gondola lift; 19 chair lifts; 31km of superb cross-country ski trails; a snow park for the freestyle-inclined and a vast array of newer snow sports, including snowbiking and snowkiting. Obertauern village itself offers wellness and fitness opportunities for all, diverse shopping options and some seriously impressive apres-ski opportunities for what is essentially a small village set at over 1,700m above sea level. Driving to Obertauren from Salzburg airport is a quiet and visually enriching journey through the Austrian countryside. On arrival one is greeted by those much-imagined elements of the quintessential alpine hideaway – snow covered ridges crowned with trees of deepest green; classic wooden chalets and smart, ultra-modern hotels. Warm and inviting waterholes, good restaurants and well-lit bars, many of which stay open till the last man standing, all contribute to the uniquely laissez-faire atmosphere. The people in Obertauern know how to have a good time. There are of course bigger and smaller resorts, but size has nothing to do with why so many people visit Obertauern. 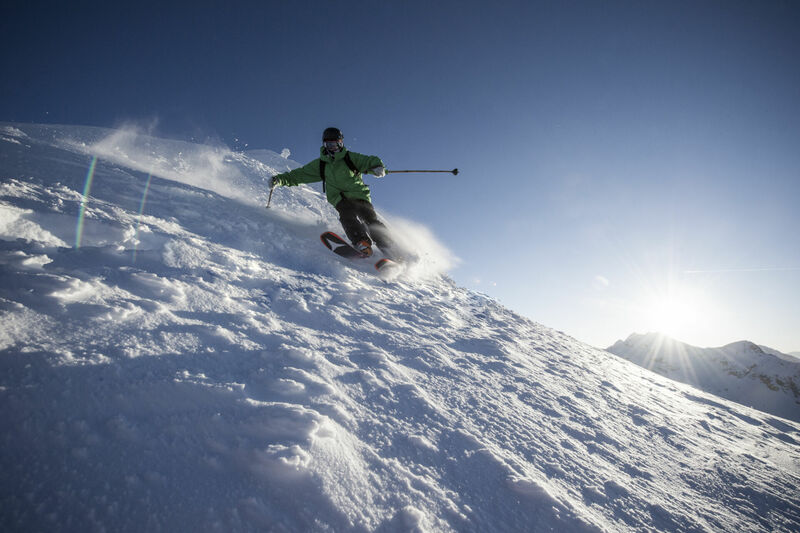 As the highest located winter sports resort in Salzburg, Obertauern has always prided itself on the reliability of its natural snow – better snow in terms of performance for your skis. If you’ve never skied before you may wonder how any resort can claim to guarantee snow and if you’re a seasoned ski-lover you will know the vast majority of resorts in Europe and across the pond often rely on artificial snow to keep their promises. Obertauern’s promise, however, is a proven fact. A survey by Gunther Aigner at the Austrian State Hydrographic Services, based on 100 years’ snow-depth data, determined a mean maximum depth of 264cm. Statistically depths in the ‘snow bowl’ have not changed in over 108 years – one for the climate skeptics. There’s still no indication the region’s snowfall might decrease. In Obertauern every piste is within walking distance. Forget your car keys, public transport and having to wait for a shuttle bus, on which your primary concern is often avoiding pointy ski poles and sharp ski edges. Regardless of where they’re staying in Obertauern everyone has immediate access to the slopes and, although not an official marketing claim of the resort’s tourism office, ‘from bed to slopes’ wouldn’t be inaccurate. The Tauernrunde is one of the most beautiful skiing circuits in the alpine world, boasting beautiful valleys, tree-lined runs and huge, sensational skies. If you are taking family who might have never skied before, or if you aren’t quite up to James Bond’s standards yet yourself, this really is the perfect place to improve. Crystal Ski and Skischule Top are two of the best ski schools in the region and both offer an excellent range of lessons. Whether you prefer one-to-one coaching or a more sociable group setting, with world-class instructors to hand, bombing down a red-run at top speeds is only three days away. If cutting the first lines across fresh powder is right up your winter wonderland you will want to hear about the more challenging activities on offer in Obertauern and, if you know someone who claims to be an expert skier or snowboarder or if you consider yourself a seasoned pro, head straight for Gamsleiten 2. Simply put, Gamsleiten 2 is one of the steepest mogul pistes in Europe. With a gradient of up to 45 degrees – an angle that can leave you feeling dangerously close to free-fall – it’s a solid challenge. And if you’ve managed that perhaps it’s time to up the ante and change the rules of the game. There’s no real proof snowkiting was invented in Obertauern but it certainly evolved there. It seems gravity is just not enough these days as more and more skiers and snowboarders are being pulled down the slopes by the wind, at fantastic speeds. The concept is simple: whilst strapped into your skis or board, hold the kite with both hands and set it perpendicular to the wind, then survive the haphazard start as the wind picks up your kite and prepare to master nature. Snowbiking is perhaps a little less sophisticated but equally speed-orientated. Keeping control of the bike whilst racing down the mountain requires both strength and skill. Catering to all tastes as it does, Obertauern has its own snowbiking school. Snowbiking and snowkiting are relatively recent trends but, if your winter sports tastes tend towards the traditional, Gnadelnam is a must-visit. This picturesque ‘mini-resort is no more than a 15-minute taxi ride from Obertauern village and offers cross-country skiing (with equipment renting); biathlon (cross-country skiing combined with rifle shooting); curling; tabogganing; sleigh rides; a playground with a considerable slide and an impressive selection of speciality fondues. This is the ideal day trip for anyone looking for time out from the slopes and overnight accommodation is available. Alternative snow activities aside and after the ‘Super Seven’, which takes ambitious skiers up the seven highest peaks in the Obertauern ski resort, it may be time to explore some of the village’s après-ski spots – but not before a brief stop-off at the famous Beatles sculpture. As well as guaranteed snow Obertauern’s claim to fame is it was here in the winter of 1965 that John, Paul, George and Ringo filmed the now-famous ski scenes in Help! – with a little help from the locals, who stood in as stunt-doubles. Gerhard Krings was George Harrison’s body double, at the time a young man in his late teens. He now owns Das Seekerhaus (www.seekerhaus.at), a stylish, ski-in-and-out, glass-fronted hotel and restaurant just above the village along the ‘Super Seven’. If you’re lucky you might bump into him sitting by the fire – be sure to ask him about the parties. Of course Obertauern offers many more traditional Austrian après-ski venues, complete with elaborate pine furnishings, open fires, decked terraces and a selection of weizenbiers is the Lürzer Alm. For skiers and snowboarders who after a day on the slopes still boast considerable energy levels, cocktails, big speakers and a lively crowd can be found at the Cinderella Bar. Kika Sroka-Miller travelled to Obertauern as a guest of the Obertauern and SalzburgerLand Tourist Offices and Crystal Ski Holidays.